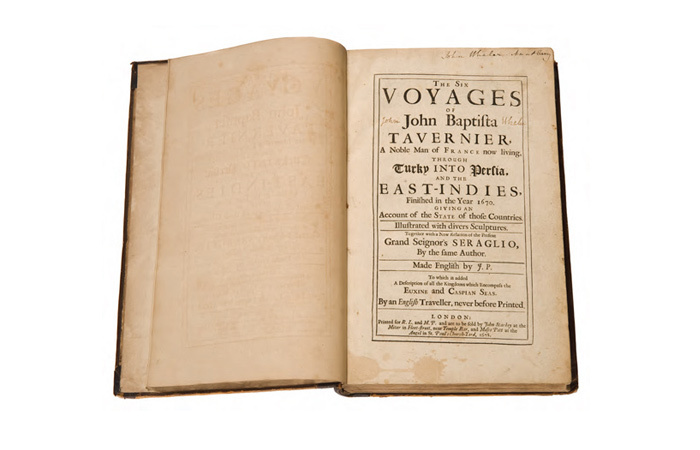 The Six Voyages of John Baptisa Tavernier, a noble man of France now living, through Turkey into Persia, and the East - Idies, finished in the year 167. Giving an account of the State of those countries. Illıstrated with divers sculptures. Together with a new relation of the present Grand Seignor’s Seraglio, by the same author. Made in English. by J.P. to which is added a description of all the Kingdoms which encompass the Euxine and Caspian Seas. By an English traveller, never before printed. London, R.L. and M.P. , 1678, 2 cilt: c.1 - , 264 s.,  planş; c.2 - 214, 119,  s.  planş. Sırtı meşin cildinde.